Your mission for the day is to declutter bath toys. I've designed this mission to be done while working on the Bathroom Organization Challenge here on the site, which is part of the 52 Week Organized Home Challenge. Of course, you could also do this mission when working on the Organize Kids' Toys & Gams Challenge which is also one of the weekly challenges. Doing this mission is simple. First, throw away any bath toys that are completely gross. You know which ones I'm talking about -- the yucky squirt ones that get mold and mildew in them. Uggghh. I think almost every parent quickly learns that those squirty toys were a total mistake to buy. Water ends up staying in them, and quickly the insides get moldy and disgusting. Then, when kids play with them they end up squiring moldy water all over themselves and everything else when they use them. Who ever thought this was a good idea? a few bath toys left after culling the gross ones only keep a reasonable amount for your child to play with. Do they really need as many as you've currently got? And finally, for those parents with children too old for bath toys now -- why do you still have them? I am bad for keeping things my children have outgrown for too long, so I understand, but if the kids no longer play with them, out they should go! Below I've gathered photos from readers who've already done this mission, to get you inspired and show you how simple it can be. There's also the mission image above to the left, showing a reader, Jenny's results, when she did this mission. She said, "Done. Just kept the foam letters. Yes we have LOTS but my twin boys love to spell long words. Now stored in a vegetable crate, over a plastic box. Hopefully I can get them to put them in the crate before getting out of the bath!" 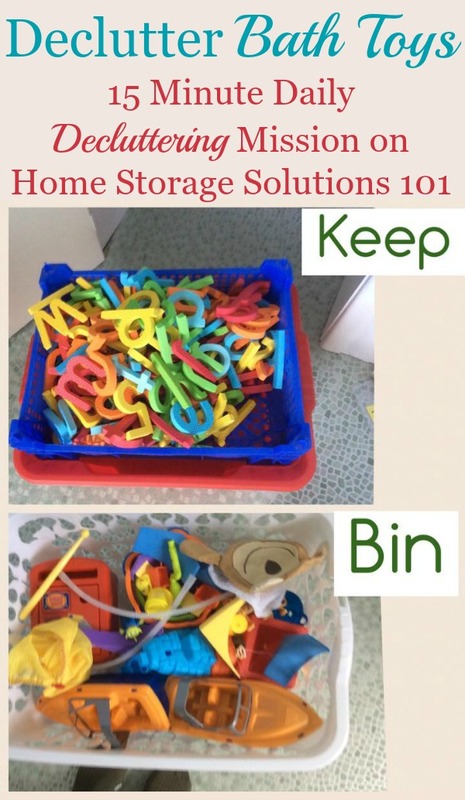 In addition, at the bottom of the page you'll find the link to the article here on the site with tips for organizing and storing the few bath toys you do end up keeping! Right Now Our Bath Toys Are Just At Bottom Of Tub: Not Good! 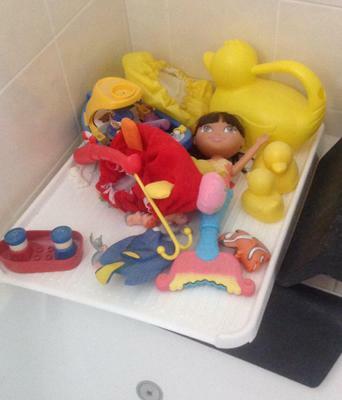 A reader, Mandi, sent in the above photo of her kids' bath toys. She said "In my kids' bath the toys just live at the bottom of the tub mostly. 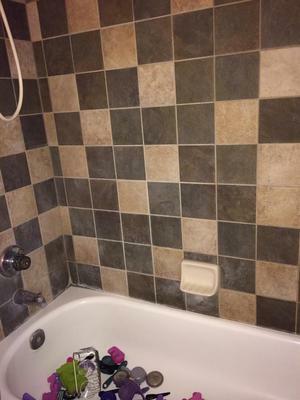 Our showers are all matte tile on the walls so nothing with a suction cup works. I'm still searching for a solution for my kids toys since the Boon frog I wanted to get won't work. Any ideas?" Thanks for sharing your picture Mandi. I totally hear you with the suction cups! They are very difficult to get to stick to certain surfaces. First, let me suggest that you declutter some of those toys. That in itself will make it more manageable. Then, see below for the link to my article about bath toy storage ideas. I totally think bathroom Command hooks are far superior to suction cups though. They stick sooooo much easier. 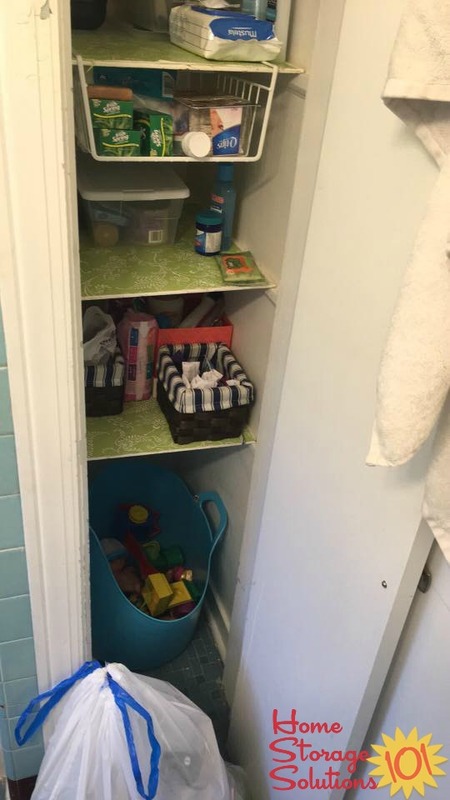 The photo above was sent in by a reader, Robin, who got rid of a bunch of her bathroom clutter in her bathroom closet. She said, "It's not perfect but a whole bag of products and old kids bath toys are garbage!" Woo hoo Robin, you did great! I have one child. I purged a whole heap of old toys, then got a sink top dish drainer to store them. It's good because it keeps the toys out of the bath but also allows them to drain, and easy to keep clean and tidy. Great job Paula! It's great to get rid of excess, and only keep what is still used and appreciated. Once you've got less of these bath toys, next you need to figure out a good way to store and organize them. You've done that, it seems. 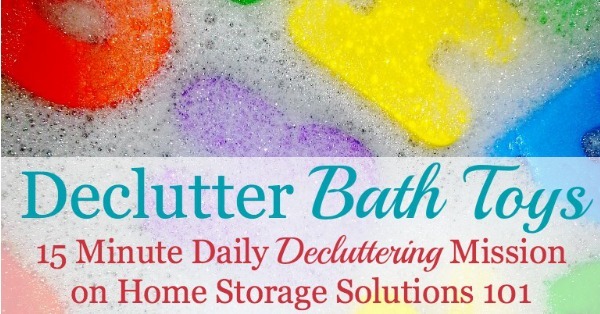 But for those looking for ideas here's my article on bath toy storage and organization ideas with lots of photos shared by readers with how they do it, and what works for them. 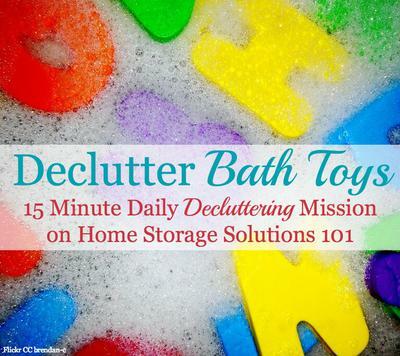 I hope this mission has inspired you to declutter your kids' bath toys. 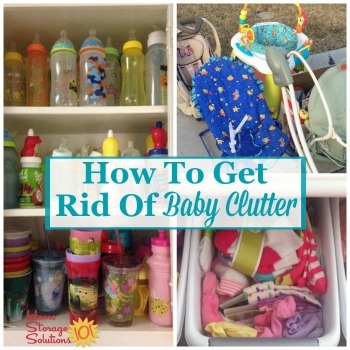 In addition, check out these tips for how to get rid of baby clutter from all around your home. wash in dishwasher and sell them! I top rack washed all our bath toys and nicely zip lock bagged them for yardsale ... More than half are gone. I threw away a bunch! I think I threw away 12, I didn't remember to count until after they were in the garbage! I keep them in an old lettuce crisper plastic container that no longer has a lid or insert, it's just a nice round bowl that fits nicely under the sink. Now it's barely halfway full! I threw out 4. I bought a beach tote, the ones that are plastic. I put the toys in to dry then can store away. My local dollar stores sells them so they are cheap. Tossed out a whole box of toys that were going yucky moldy. My son was upset for a day or two but ok now, he thinks they're getting recycled to make new toys, bless him. any way to recycle these toys? Can you recycle ducks that are plastic? I'd like to get rid of some bath toys but don't want to just throw them in the garbage so they go to the landfill. Any ideas on recycling?